These delicious muffins deliver 5 grams of protein each - plus 2 grams of fiber! The fiber and protein boost comes from the lentils incorporated in the muffins. Check out this recipe and to learn more on how lentils can benefit your health - listen to a recent radio interview registered dietitian, Molly Morgan, click here. 1. Pre-heat the oven to 350 degrees Fahrenheit (180 degrees Celsius). Prepare 16 muffin tins with paper liners or non-stick cooking spray. 2. Combine the cooked lentils and orange juice in a food processor until the lentils are pureed. 3. In a large mixing bowl combine the pureed lentils, white wheat pastry flour and salt. Stir to combine. 4. Then add chia seeds, sugar, vegetable oil, vanilla yogurt, and eggs. Stir to combine. Then add-in the dried cherries and stir to combine. 6. Pour 1/3 of the muffin mixture in each of the muffin tins. Bake for 20 - 25 minutes, or until a toothpick comes out clean. 7. Cool the muffins on a cooling rack. 1. Preheat oven to 350 degrees F. Prepare a muffin tin with muffin pan liners. 2. In a large mixing bowl, combine flour, sugar, baking powder, and salt in a large bowl. Make a well in the center. 3. To the center of the bowl, add egg, coconut milk, melted butter, lemon zest, and lemon juice. Mix just until combined. Then stir in the yogurt and gently fold in blueberries. 4. 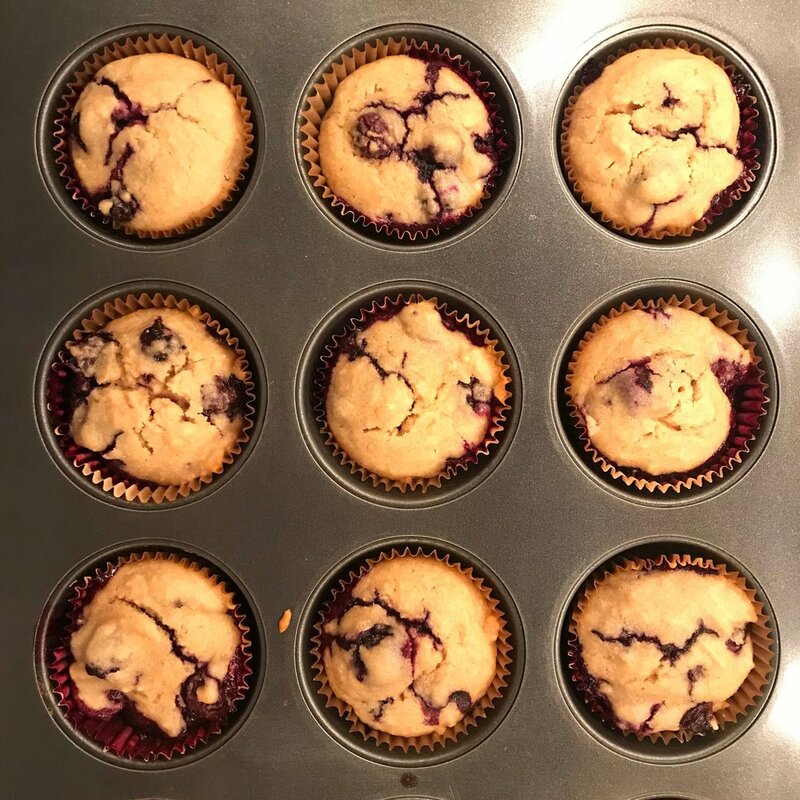 Divide the batter into prepared muffin tin, fill each muffin cup full with batter. Bake for 25 to 30 minutes, or until a toothpick comes out clean. As the holiday season is upon us and your schedule gets extra busy! Here are some tips to help you through the holiday whirlwind. Schedule time and sneak in time to stay active throughout the holidays! Although, also embrace the other ways that you will burn calories during the holiday season preparing for gatherings. For example, one hour of wrapping presents burns about 90 calories, one hour of cleaning burns about 150+ calories, one hour of cooking burns about 240 calories. Calorie counts based on 150-pound person. Click here for a calorie calculator. Stock up on healthier snacks! Sure there will be extra snacks and treats around throughout the holidays. 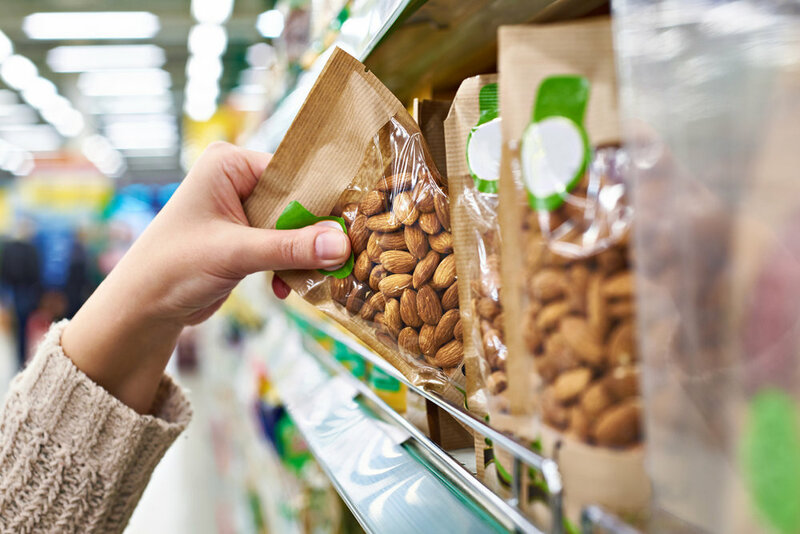 Also stock up on healthier staples like: almonds, pistachios, sunflower seeds, etc. They are perfect to put out at holiday gatherings or grab to take with you to keep your energy up while running errands. 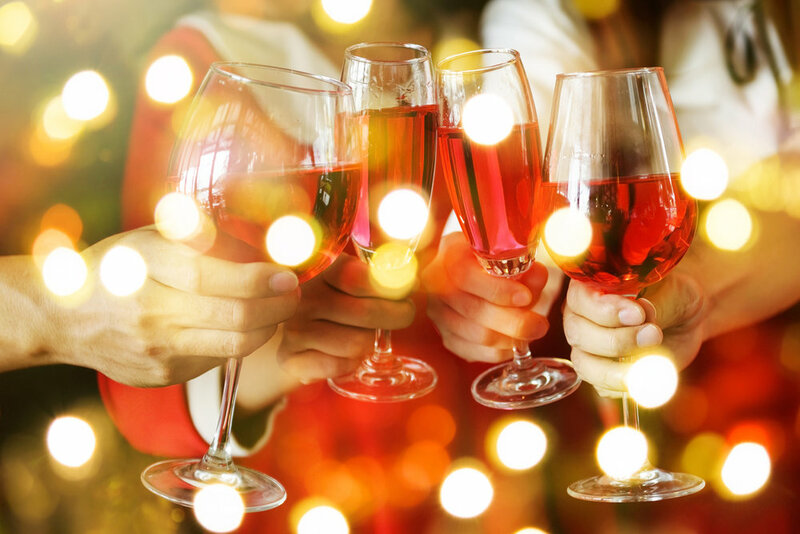 Holiday celebrations often come along with drinks! Balance out alcohol by mixing in a glass of water or club soda between drinks. It will help to keep your overall intake in check, hydrate you, and leave you feeling better the next day. 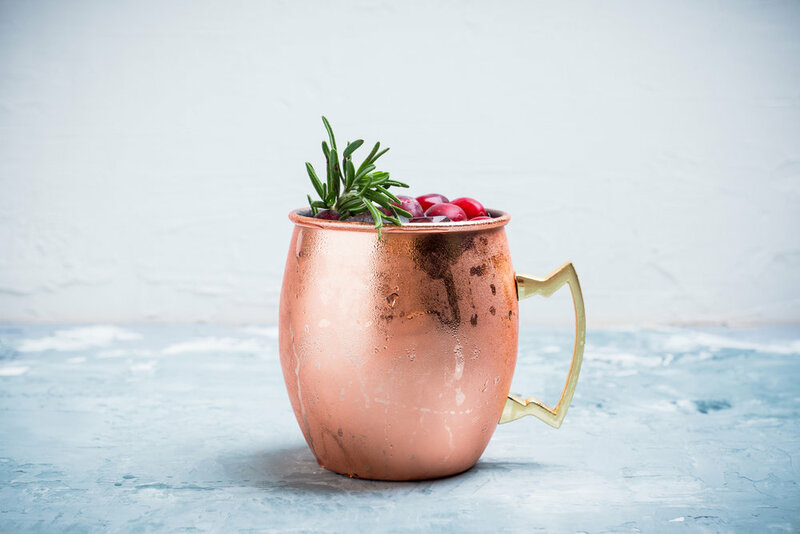 If you are throwing a party, serve up a fun non-alcohol “mocktail” like a Sparkling Holiday Mule! See the recipe below. Muddle a lime slice in a copper mug (or other serving glass). Add ice and fill with ginger lime mule seltzer. Garnish with whole cranberries and a sprig of rosemary. I'm on a constant quest to try new foods, and products! Here are a couple of recent options that were a hit. These Cotton Candy grapes from the Grapery are full of flavor and delicious. They are super sweet and definitely have a cotton candy-like taste. In my opinion they are worth putting on your shopping list and can even double as a dessert. The Grapery website explains more about the way that these grapes get their unique flavor, its really interesting and worth a read, click here! And don't wait, they are only available for a short period of time, according to their website now through September 20. Sometimes schedules call for on-the-go options and Pressed by KIND bars are a perfect way to add in fruit on busy days or in lunch boxes! Plus the bars have a simple ingredient list and each has 2 servings of fruit per bar. For example, the Cherry, Apple, Chia bar ingredient list is literally - cherry, apple, and chia. There is not any added sugar or sweeteners, which is great! Each bar has 130 calories and delivers 3 grams of fiber. They are also available in additional flavors including: Mango Apple Chia, Dark Chocolate Strawberry, Dark Chocolate Banana, Strawberry Apple Cherry Chia, and Pineapple Banana Kale Spinach. You can order Pressed by KIND bars direct from KIND Snacks website or look for them in grocery stores, Target, and more. One of the newest ways to enjoy veggies is 'riced' veggies. The texture of veggies when they are chopped fine is so interesting and especially cauliflower, takes on the texture of almost being rice-like. You can make your own riced veggies but these frozen bags are super convenient! Plus they come in great flavor combinations like pictured here, Cauliflower with Lemon and Garlic. Once cup of riced veggies has only 30 calories and is a perfect side dish! Or try plain riced cauliflower as a stand-in for rice with stir-fry or even made into a fried 'rice' dish. Look for riced veggies in the freezer section of the grocery store. Click here for more information on Riced Veggies from Green Giant. Note: These product picks are not an advertisement, just products that Creative Nutrition Solutions owner and registered dietitian, Molly Morgan loves! Packing lunches is back on the to do list of many people! Here are some tips and products to help keep school lunches interesting! 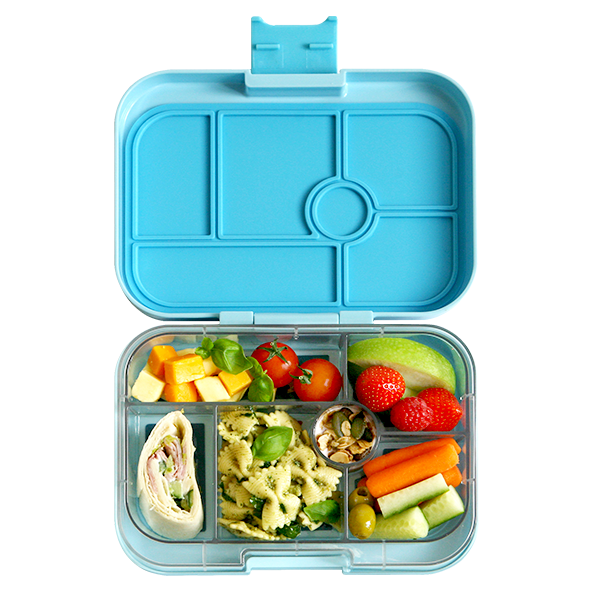 Lunch boxes like Yumbox (pictured here) are perfect, especially for little guys and girls. These would be best for ages K - 5 as far as portioning and the amount of food you can fit into the box. One of the best parts of this design is there is just one easy to use flap that they need to open to get into their meal! And the Yumbox is truly is leak proof; we have been using this style lunch box for two years without any leaking issue. Wraps for lunch are a great way to use up leftovers and have a lot of variation in a lunch. For example, grill extra chicken the night before, then cube that up for lunch the next day. Opt for whole grain wraps and also load the wrap up with plenty of veggies for filling! To make lunch preparation easier in the morning, start the week with a container of chopped wrap fillings like cucumbers, carrots, peppers, onion, and spinach. This will help lunch come together quickly in the morning. A fruit and yogurt parfait can make a filling lunch or addition to a lunch! Fill reusable containers with layers of Greek or Icelandic yogurt (e.g. Chobani, Siggis), fruit, and granola (e.g. KIND Snacks Healthy Grain Clusters). Even consider a drizzle of Barlean's Omega Swirl Oil for a boost of healthy fats. Creating a winning combination for lunch to fill and fuel up an athlete can be a challenge! Check out the Fuel2Win for On the Go lunch ideas! Click here to download the handout. Also check out delicious recipe ideas like PB Chip Energy Bites which could be a great addition to a lunch! Are you in need of quick dinner ideas? Grab this delicious Mango Ginger Chicken recipe from my Olum's Cooking project. Click here for the recipe video and recipe. Mango Ginger Chicken - Quick and Easy! This salad recipe has a homemade jalapeno vinaigrette dressing that is absolutely delicious and not too spicy! Plus it is really beautiful and colorful.